McGill will present honorary degrees to two giants of medicine – Dr. Jonathan Meakins and Dr. James C. Hogg – next month at a scientific symposium being held jointly with the McGill University Health Centre in celebration of the opening of the Glen site. From left to right: Dr. Jonathan Meakins (Photo courtesy of the MUHC) and Dr. James C. Hogg (Photo courtesy of UBC) will be awarded honorary degrees on March 27. 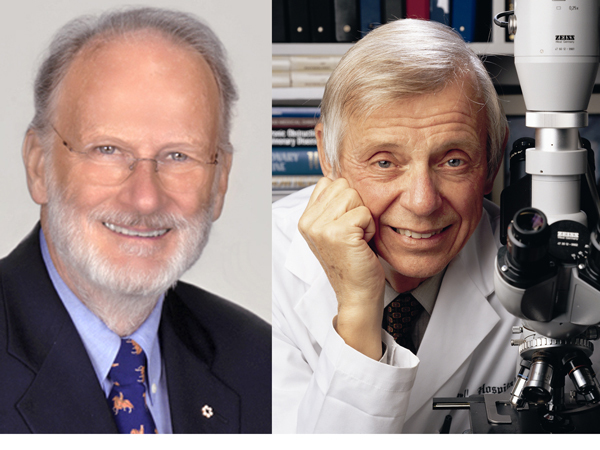 McGill will present honorary degrees to two giants of medicine next month at a scientific symposium being held jointly with the McGill University Health Centre in celebration of the opening of the Glen site. Dr. Jonathan Meakins, one of the most distinguished surgical leaders in the history of McGill’s Faculty of Medicine, and Dr. James C. Hogg, widely recognized as the world’s leading authority on the pathology of chronic obstructive lung disease, will be honoured on Friday, March 27, at Centre Mont-Royal, 2200 Mansfield St., across from the downtown McGill Campus. There will also be an MUHC-McGill “homecoming” event on Thursday, March 26, including a special dinner attended by Principal and Vice-Chancellor Suzanne Fortier, as well as special tours on Saturday of the new Glen site, which is nearing completion and is scheduled to begin receiving patients in April. The events will bring together the communities of all the MUHC hospitals along with the Faculty of Medicine and the University. This will be an opportunity to reflect on the future of medicine alongside some of today’s greatest physicians, nurses, health practitioners, staff, researchers and teachers. For information on the program and how to register, please visit this MUHC website. The honorary degrees, approved by McGill’s Senate, recognize two individuals who have worked at the MUHC and taught at McGill and whose careers subsequently had enormous impact nationally and internationally. Grandson of Dean Jonathan C. Meakins and son of Jonathan Meakins, both Professors of Medicine, Dr. Meakins completed his medical training in London, Ont., before returning to Montreal to complete his residency. He joined the faculty after completing a fellowship in Cincinnati and then rose through the ranks to become Edward Archibald Professor of Surgery and Chair of the Department. He left McGill in 2002 to take the position of Nuffield Professor of Surgery at the University of Oxford, considered one of the most, if not the most prestigious chair in surgery internationally. He was named Emeritus Professor of Surgery at Oxford upon his retirement in 2008, whereupon he returned to Montreal. Author of more than 200 articles and 85 book chapters, Dr. Meakins has been a world leader in general surgery, widely known for his pioneering work on infection and immunobiology. 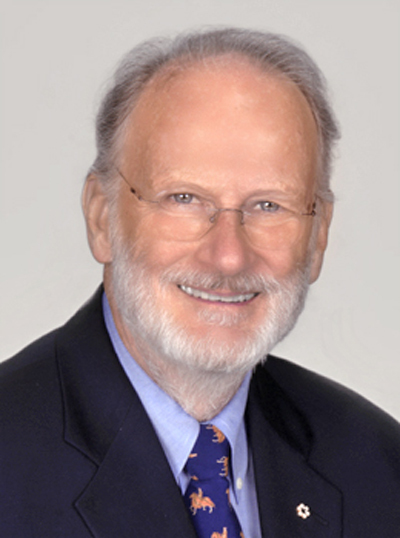 In addition to his scholarly contributions, Dr. Meakins has contributed enormous service to the McGill community and to Quebec society through his administrative work and most recently has taken on the role of head of the Art and Heritage Centre of the MUHC, established to ensure priceless heritage artifacts housed at the RVH, Chest and Children’s are properly taken care of in the context of the hospitals’ closures and move to the Glen. Dr. James C. Hogg, widely recognized as the world’s leading authority on the pathology of chronic obstructive lung disease. / Photo courtesy of UBC. After completing his medical training in Manitoba, Dr. Hogg came to McGill where he obtained a MSc and a PhD before joining the Faculty. In 1977, he was invited to the University of British Columbia to inaugurate the Pulmonary Research Laboratory at St. Paul’s Hospital, which under his leadership, developed into the foremost laboratory for clinicopathological lung research in the world. In recognition, the unit that is the direct descendent of the PRL is now known as the UBC James Hogg Research Centre, one of Canada’s premiere units dedicated to cardiopulmonary research. Dr. Hogg has also made critical contributions to the study of other lung diseases, such as asthma and pulmonary fibrosis and has been responsible for the training many individuals who have gone on to leading roles in pulmonary science worldwide. One of McGill’s most outstanding graduates, he has remained a friend (and friendly competitor) of the McGill respiratory community since his move to UBC. Dr. Hogg has received numerous awards, including the Order of Canada, the Royal Society of Canada and an honorary degree from UBC. 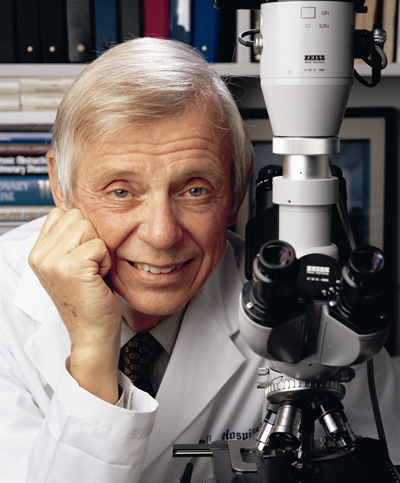 Most notably, he has been elected to the Canadian Medical Hall of Fame and been the recipient of the Wightman Gairdner Award, both of which are among the highest honors that the Canadian medical community is able to offer.